Cork, Capital of the South, a City with the world as its horizon. In the great days of trade it s harbor drew ships from all points of the compass, and with them new ways and influences. At a crossroads of commerce and culture, Cork’s contrasting influences have stimulated the mercantile as well as the literary arts, a passion for sport and politics and an air of being distinct. Cork clusters on the banks of the River Lee, the soft limestone of the city reflected in the water’s constant flow. It bears the stamp of an older street plan – of narrow avenues and winding lanes and steep hills climbing up from the river. 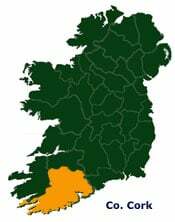 Cork is a small city, with a community bound by strong bonds of loyalty. Further along the harbor sit Midleton and the port of Cobh, gateway to the Atlantic. Blarney lays just a stone’s throw away, as does Kinsale, the route to West Cork. Eventually though you are drawn back to Cork, with its theaters and galleries, good music and pubs and every year a series of festivals that includes one of the biggest dates on the international jazz calendar. The southern city is a stimulating host, as befits a place that has produced more than a share of artists, writers and wits.